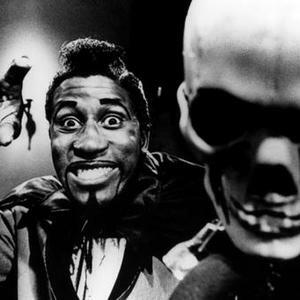 Jalacy J. Hawkins' wild songs and onstage theatrics of his self-created brand of voodoo jive earned him the name Screamin' Jay Hawkins. His act has often featured him emerging from a casket to sing his best-known hit, "I Put a Spell on You" (1956), carrying a skull smoking a cigarette. He is considered the first true "shock-rocker," with his onstage antics. I Shake My Stick At You!